Last week we played a game based on a hypothetical scenario I dreamt up which is based around the premise that the British had been defeated at Waterloo and were in the midst of falling back to Antwerp in order to be evacuated by the Royal Navy. The retreat has hit a bottleneck at a pontoon crossing of the River Rupel, just below the village of Boom (yes, that's its real name). To stave off the pursuing French the British have prepared the village for defense by tasking a composite brigade to hold as long as possible. For further details on the scenario feel free to check it out here in the 'Past Games' section. 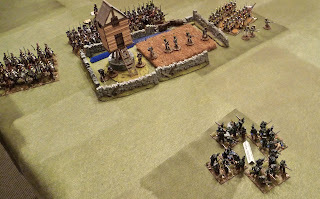 A few weeks previous I had put on an earlier edition of the same scenario for friends up in Saskatoon using 'Black Powder' which turned out to be good fun. You can read Tim's excellent report of that game here on his blog. To change things up I decided that for this replay we were going to us 'Republic to Empire' as several of the guys here have copies of the rules and wanted to get a better sense of them. 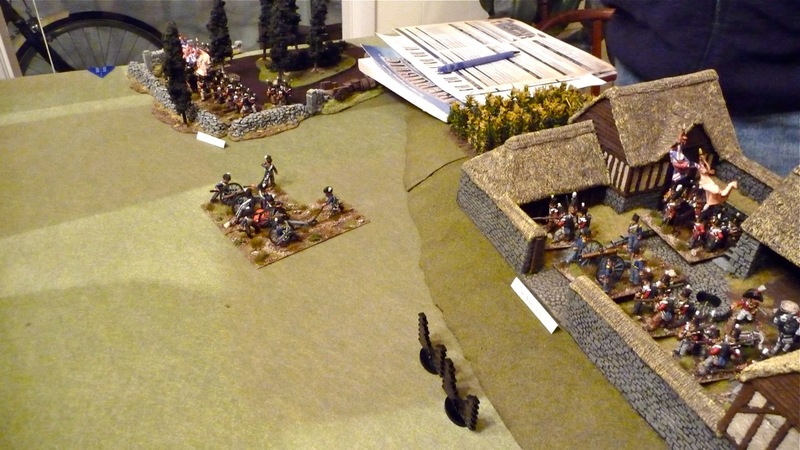 Dan took on the defense of Boom by the British while Sylvain and Stacy each took a reinforced French brigade each. Stacy had an attached regiment of Dragoons while Sylvain commanded the Divisional Artillery Battery (8pdrs plus howitzers). This was the battlefield as seen from the French entry position. ...from the British perspective ('Boom' is in the foreground). ...and finally an overhead image. I gave the option to Sylvain and Stacy to deploy the French guns forward along with a single infantry brigade in order to conduct a preparatory bombardment of the village. The downside of this would be that the British would get some extra time to evacuate the army, the French guns would be at greater risk of counterbattery/skirmishing fire and the second French brigade would have to follow on later. After some deliberation they decided against this in favour of entering the table as a cohesive force and assaulting the village as soon as possible. Here we see the 'Royal Welch' deployed in Boom with a couple sections of RHA on the outskirts and the 28th in the woods. Sylvain and Stacy knowing they were 'on the clock' set up both of their French brigades in attack columns with the artillery limbered up and moving forward. Ney took a central position just in case he needed to shivvy any of the new conscripts along. All in all the French were arrayed to roll ahead with as much force as possible. Initiative went to the French for the first turn and both brigades ground forward. As they had extra Maneuver Points (MPs) to spend Sylvain decided to use an Exploitation Move in order to move his guns further forward and get them unlimbered for action (at medium range to the village). 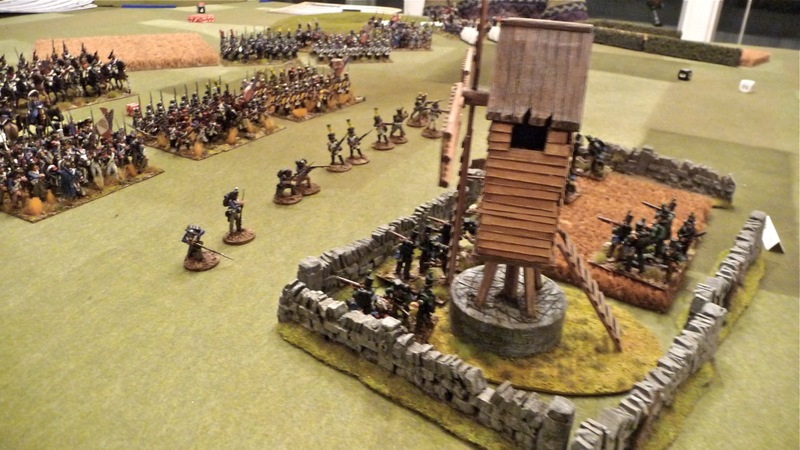 Stacy was completely unflapped on seeing the Rifles to his front and ordered his columns forward, intending to pin the 95th down and destroy it by sheer weight of numbers. The initiative for the second turn went to the British and Dan again held his his position and his fire - nerves of steel indeed! Stacy's French duly continued their advance. His voltigeurs were arrayed forward and began to give harassing fire on the partly concealed 95th. 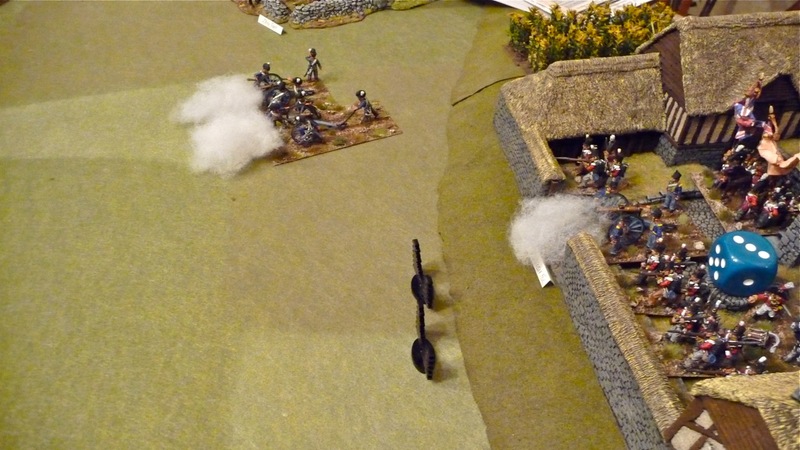 Sylvain fired his battery at the Rifles in support but the stone enclosure shielded them from most of the roundshot. Sylvain made sure to keep his infantry roughly in line with Stacy's so as not to get separated and to provide support if needed. He also didn't want to allow it to get too far forward and mask the guns which would start bombarding the village. The French took the initiative in the next turn and Stacy's brigade began to close in, preparing for an assault on the Rifles' position behind the stone wall. The 95th bagan to take telling casualties from the combined skirmish fire of the three French battalions. Dan has the Rifles fall back to the rear of the enclosed field thinking he may have a forlorn hope on his hands. On the other flank Sylvain acknowledges that the situation with the Rifles is being addressed and so has his gunners re-lay their cannon on the village of Boom. 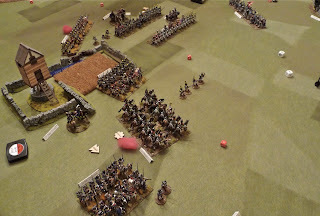 In the next turn Stacy's voltigeurs cross the stone fence and push into the field to better close with the Rifles. 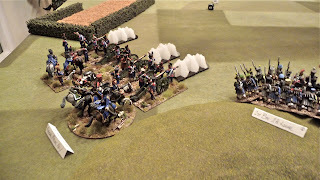 The French 2e Dragoons, which are finally provided a clear path to the front, are now frustrated by having to maneuver so close to the stone field. As they don't have a clear charge-line to the 95th's line they move instead trying to get into a better position. 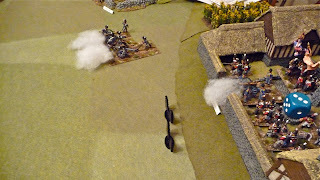 The French battery switches target and starts to pound the village in preparation of the assault. Dan realizes that with three battalions of infantry and a regiment of cavalry bearing down that the jig is up for the Rifles. He decides that they must try to leg-it back to a woodline several hundred yards to his rear. He knows he can't make it in one move so hopes he can roll well enough for his command to get halfway and then form square. He will then pray to get the initiative for next turn so he can attempt to sprint the rest of the way to safety. Its a long shot but he really has little options open to him. He rolls well enough to get out in the open and to form square - half way there! Now comes a very important roll for initiative. 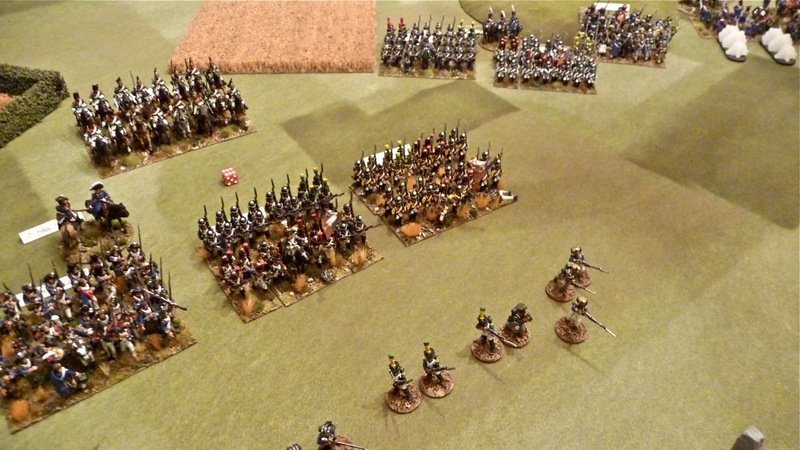 If the French seize the initiative they can simply pin down the Rifles in their square with the dragoons while blasting it apart with the three advancing battalions of infantry. Lady Luck holds out for Dan and the British get the initiative! 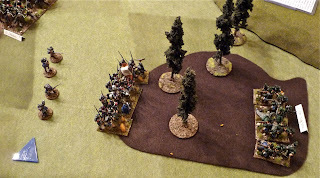 Its not over as Dan needs to get a good command roll for the British so the Rifles can not only break out of their square but also make a mad dash for the woods. Again, he rolls exceedingly well and manages to extract the 95th out of a very sticky wicket. The French brigades soak up the casualties with great aplomb and continue their advance. 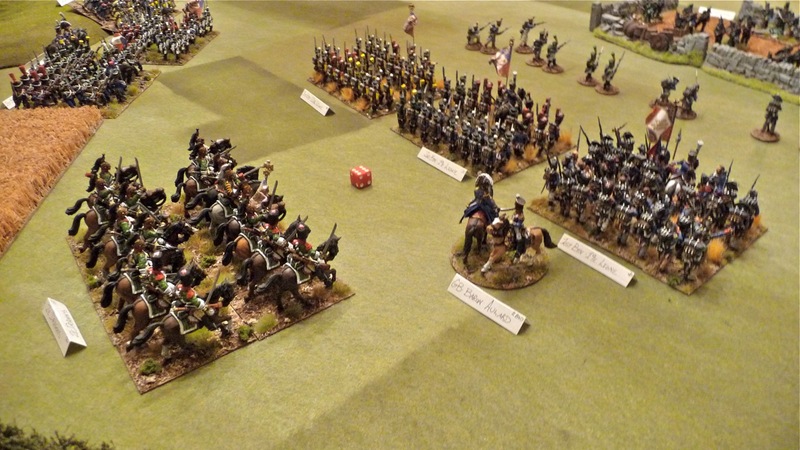 The dragoons see the British horse artillery deployed outside the village and decide to initiate a charge. Upon hearing the sound of the cavalry trumpets the artillerists see the danger, realize that their position is compromised, and so decide that their expertise would be best served on the other side of the river (i.e. they kick up their heels, abandon their guns and run like hell). The cavalry take some fire from the defenders in the village but pull up from their charge quite satisfied with themselves. This leaves just the one section of foot artillery defending the village. Sylvain continues to bombard the village but realizes that at this range his guns will probably not reduce it quick enough to assist the first assault. (Note: In hindsight Sylvain realized that if he had unlimbered his battery at close range he would have had a much better chance of discomforting the defenders more with his artillery fire. Good to know for next time.) He then shakes out his brigade into line, diverting one to pin down the 28th Foot which is deployed outside of Boom while the others start their final advance on the village. Stacy tasks the 19e Ligne to winkle out the Rifles while its second battalion angles towards the village. The British hold tight with all battalions firing measured volleys at the French inflicting some casualties. The dragoons come under canister fire from the foot section in the village and they decide to retreat to the rear. The 19e charge the Rifles and a furious close combat occurs along the wood's edge. It goes to three successive bounds due to their being no clear initial victor, but finally the 95th preservers by forcing the 19e to pull back. Nonetheless, both battalions are so mauled in the action that they are now basically combat ineffective. The 19e and the 95th clash in the woods. For the French the moment of decision has arrived. 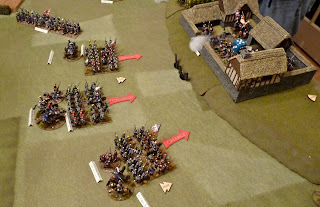 Sylvain wisely orders his two French battalions that have been tasked with the assault to form attack columns, compressing their frontage in order to allow as many into the attack as possible. Stacy's remaining battalion also moves itself into position. Both French brigades bring up their respective assault pioneers for their help in the attack. And if this wasn't enough, Marshal Ney, plus the two French brigadier generals move to each of the columns to inspire the men with their direct leadership in the assault. One can just hear the drums and fifers sending the French forward into their desperate assault on the village! Good Golly! Will the French succeed in storming the village? Or will we see the British repel the attack and hold out long enough for their comrades to escape? The suspense is thick in the air! You've paid for the whole seat but you only need the edge! Tune in later this week for the exciting conclusion of "When Things Go Boom"! Awesome game gents - looks great! Would you mind sharing a few pointers with a Napoleonics Newbie? How big is the table you are playing on? How many Regiments do you normally field? Where is a good starting place for someone used to playing Games Workshop's Warhammer Fantasy and 40K games? The table in the report is 5x8 but this scenario could easily fit on a 4x6 as its not that demanding (figurewise). We've been playing with what we have painted so I developed a scenario which is quite tiny with only 2 battalions against 4. As for rules I'd suggest 'Black Powder' as its very accessible and gives a great game - its my current favorite (and believe me I've played A LOT of rules, its kinda sick really). BP was developed by Rick Priestly who, as you know, was instrumental in Fantasy and 40K. 'Black Powder' owes its genes to his Warmaster rules but is more elegant, in my opinion. The other thing that is great about the rules for someone who is just starting in building a Napoleonic force is that there are no defined figure requirements - you can basically build to your own specs and the rules will conform. This is almost unheard of in other rules which usually define some sort of figure ratio (1:20, 1:60, etc.). Anyway, let me know if you have any other questions - happy to help.